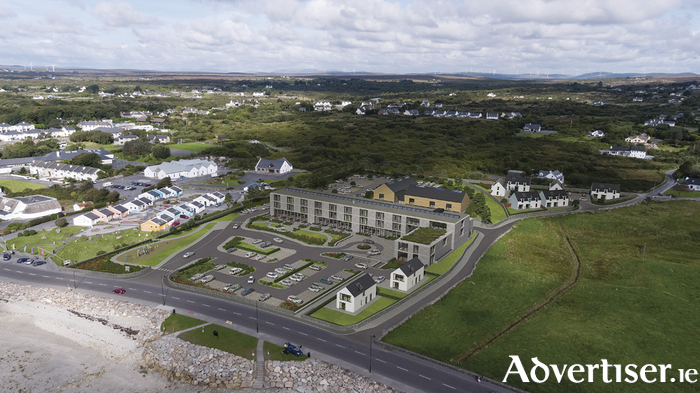 Baile Éamoinn Teoranta are seeking planning permission to develop Óstán An Chuain, a new four-star hotel and artisan food innovation hub with state of the art fitness, wellbeing, and leisure facilities in the village of An Spidéal. A site which lies to the east of An Spidéal and adjacent to An Ceardlann, has been identified as one which can accommodate Óstán An Chuain, a state of the art 80 bedroom Hotel and Leisure development. Óstán An Chuain will enhance An Spidéal’s position as a premier destination on the wild Atlantic Way tourist route while remaining true to the proud, progressive, ambitious and vibrant Gaeltacht community that is An Spidéal. Óstan An Chuain will be tastefully finished to the very highest industry standards and in a manner reflective of the uniquely rugged and warm natural beauty of the Cois Fharraige Connemara Gaeltacht. The development is to be undertaken by Rónán Bairéad, who has deep rooted family ties to the area and a determination to place An Spidéal to the fore of Irish cultural tourism. Rónán believes that this development will be a natural asset to the people of An Spidéal and Connemara by providing them with a means of attracting large scale events such as Comórtas Peile na Gaeltachta, unique music and art events, concerts and festivals, which should be regular events in the beating heart of the Gaeltacht. A function room capable of accommodating in excess of 300 guests is part of the planned hotel development and this is sure to have considerable positive knock on effects for the local community on a continuous basis. The development will also include an artisan food innovation hub to nurture and showcase Connemara’s unique food and drink industry. This centre will provide the facilities and resources to allow a co-operative development of these products and a venue in which to display the wares of local artisans to their fullest potential. The focus will be on bringing to the fore culinary, brewing, and distillation practices, perfected by the people of Connemara through generations of innovation, resourcefulness and imagination. It is envisaged that this development will champion and support the Gaeltacht food brand and establish An Spideál as a food tourism destination as well as creating an innovative food and drink education hotspot. Óstán An Chuain is delighted to have the support of Údaras na Gaeltachta as it has the capacity to promote tourism growth in An Spidéal. Along with its potential to create 80 to 100 new jobs in the area, with the employment of Irish speakers a priority, there will also be considerable opportunity for additional seasonal and special event employment. Rónán Bairéad has confirmed that he has had detailed discussions with Irish Water and he is confident that with local community support Óstan An Chuain can be delivered in tandem with, and should accelerate, Irish Water’s planned upgrade to the local infrastructure. Page generated in 0.1949 seconds.